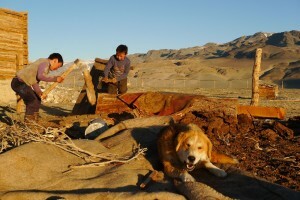 Our arrival in Olgy was full of action, also very intensive and more chaotic than anything else in “my Mongolia” before. I was hopping on and off the Gazik at least 4 times at various places, where my co-travelers had some family values, members, friends or relatives. Since I speak no Mongolian, except for a few words, I somehow felt like some dirty laundry being moved from one house to another. At each place, there was lots of tea being served, also soups, meat dishes, potatoes and at least half a dozen of ‚sto gram‘, which means a stakan of vodka. Before you down the first sto gram, you dedicate a bit to Mother Earth by dipping your ring finger into it and splashing a bit of a mug. Some kind of a shaman-to-protect-us ritual. After the first one, it’s all a no chaser downing process. Singing came up, pictures continued, and blurriness finished the warm welcome. Surprisingly “my form” is still good enough and, luckily, heavier and big Mongols got quicker to the ground than me. I can’t really use the term years of practice, since they are almost all over 50 and know well how to play this game. When we finally came to the Zharghan’s house (I have no idea what time it was and barely remembered we had not walked but someone drove us home), he was comfortably wasted, so his son took off his shoes and his wife, who had not seen him for a month or so, only quietly put a pillow under his head. I sat in a small room with about 7 other people, all leaning against the empty wall. Being polite and feeling alright, I even tried some Russian with the group of strangers in the room. Half an hour later I only blew up my mattrace and with some kind of a smile on my face zipped up my Mountain Hard Wear sleeping bag. At that moment my travel through the wild Mongolia was over. I am waking up in the middle of the night. It’s cold, I have “the Sahara” in my mouth and can’t breath whatsoever, since my nose is completely blocked. It’s pitch black, there are people sleeping around me, Zharghan snoring, but otherwise I haven´t got the foggiest idea about the constellation or the number of the attendees. I know there is my bottle of water handy somewhere, but at the time being, have no idea where. My bladder is close to giving up. I need to get out into the freezing darkness. Memories of high altitude places in Nepal came to my mind, the places, where you have to do such an activity 3-4 times a night, and every night. I step under the starry skies. There is no light, just theirs. I don’t remember seeing anything, even close to something similar to this, in my whole life. It surely is at least 24 below zero, so just a few minutes later I am back, breathing into my sleeping bag and knowing that any liquids consumption before the sleep next night will definitely be skipped. I am waking up before 7 am. The room is full of the sleeping family members. It’s so cold that I dig back my head into the blue sleeping bag. The family wakes up but it’s the mother who needs to get up first. Cold steam leaves my mouth while she puts some wood and the dried yak dump on fire. The oven makes the place hot quickly. We are having a morning milk&salt (traditional Mongolian) tea, well, 5 cups per person at least. Olgyi is the second largest city in Mongolia (supposedly populated by about 150k people). 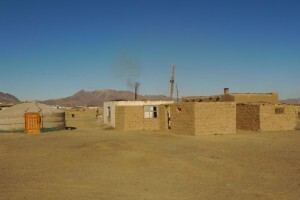 However, it’s not a Mongolian city really, since most of its inhabitants are actually Kazakhs (Kazakh Mongolians). An hour in the city was enough for me to know that, in some way, I was truly stuck in here. I generally prefer land travel and avoid flying as much as I can, but this time I need to wait for a flight, since there is no other choice for me to get to Kazakhstan. The next and the only flight leaving Olgy is scheduled in a week. Luckily (and stupid to say), there is an internet café, which I consider almost a miracle and a life savior in the city center. Nobody, however, browses, nor types. It’s purely an online multiplayer venue, where the youngsters enjoy reaching another level in blood hungry PC games. It’s been a week since I left UB and tomorrow will be a big-big day for all of Olgy’s inhabitants. It’s a day called Navruz, which is an adaptation of the pre-Islamic vernal equinox or renewal celebrations (equivalent of our New Year’s) and by far is considered the greatest holiday in the whole Central Asia. The kids clean the houses and help mothers with preparing food, hang carpets on the walls and add up a few more decorations here and there. For me, it’s finally a day when I can go and take a shower. There is no toilet, apart from the squatter outside that the few houses share, neither the running water in the 1 room house, where I stay with the Zharghan’s family. (A wish is not to finally have a porcelain toilet, on which you can sit instead of performing a skiing position, but to have a toilet that is finally inside). I have no clue how the showering system works and so I diplomatically point out that it would not be a bad idea to (finally) take a shower. Zharghan rang some number and says we would be going to a sauna at 3.20pm that day. We then went to the city together and split our ways around noon time in the internet café after having a sto-gram from the freshly purchased bottle. Before 3 o’clock Zharghan picks me up at the internet place again and we leave together for the shower. It´s 3.20pm when I am entering a strange, old looking building with the public baths and what I see really offers me a serious cultural shock. I am looking at an incredible number of people waiting for their turn to get inside, running, squeezing, standing, skipping the queue to pay and get a receipt with a waiting time. We have none, and evidently, the phone reservation meant absolutely nothing. We get a new bath time: 4pm. Well, it ended up to be a 70 minute wait in the end and I was at the stage of giving up any showering, ready to leave the place and keep putting my icebreaker merino underwear into test for another day. Luckily, all went fine in the end, we took sauna for an hour, during which I soaped up my entireself 3 times. It was a great feeling to be clean again, especially when being aware that the next shower was not going to be taken sooner than in 4 days, in Kazakhstan. This is how it works here and it surely takes time for me to get used to these really hard and unimaginable conditions of living. All backpacking in general involves some kind of stepping out of your known homes, places and all other zones of comfort in your life. Mongolia with its purist way of life represents a proper test of endurance and perseverance to stay calm, happy, positive, and patient. Dozens and dozens of times I caught myself in situations, when being exposed to such a little comfort and hygiene status and allowing myself only the very base of physiological needs. I had been to some poor countries and places before, out of which I’d put Bangladesh as the hardest destination to travel, but being here now, in winter Mongolia, I consider it its hardest competitor. Sleeping on a floor of a small house with a 6 member family is still fine, also not having running water available for weeks, being many times either too hot or two cold, wearing the same clothes and not having any personal space to change a simple clothing item seems bearable. At the same time though, to represent and be talkative, positive and not complaining in all that long time, this all may possibly offer a really strong test of character. 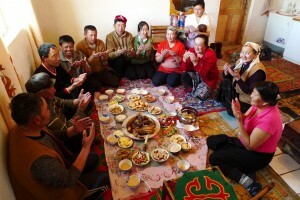 There are surely big differences in duties performed by men and women in Kazakh/Mongol families. Father is surely a breadgiver and babymaker and works many times outside of home, not seeing his family for weeks or months. Almost all men smoke, being outside or inside of the house. It’s completely normal for a woman to have 5-7 children. Women with their kids take care of the household. Wife usually makes bed for the family members, cooks, mops the floor every night, hand washes clothes and does the whole cleaning in general. The whole week in Bayon Olgyi actually ran pretty quickly and it was a great experience to see how people live in this still unexplored part of our planet. The weather was improving and getting warmer and warmer every day. It was sunny pretty much every day but the temperatures dropped easily by 20-30’C by nights. 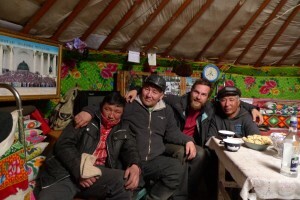 My time in Western Mongolia was full of observations, learning things about Kazakh Mongols (as well as myself) and was packed with local experiences. We ate rich food consisting of meat every day. There were guests and neighbours coming and visiting our house during every single day from 7am till late midnights. People sit, have a tea, discuss somthing, talk, eat, leave to let the others come and so it goes. Slurping soup and tea is a must and, being later out of Mongolia, in Kazakhstan, I caught myself still slurping, which I found pretty funny . Burping is fine and noisy farting is allowed only to father in the family. One of the highlights of my last week in Mongolia was a 2 day trip to a town called Sengel, where we went to visit Kenz Bair and his family. The drive, welcome, hospitality, wooden houses and fences in the village, sto-grams, nature with snow capped mountains behind the frozen lakes wrote down just another unforgettable experience in my heart.